Notes: This premiered at the 60th Locarno Film Festival, and is directed by Fumihiko Sori, best known for his live-action work. The year is 2077 and Japan has been isolated from the rest of the world due to rampant breaching of international laws on robotics and android research. Though shrouded in mystery, she is still highly influential because the main form of export comes from Daiwa Heavy Industries that makes virtually all the robotics machineries required to run any economy. An information leak and sinister meeting that ends in the recovery of an android leg finally arouse the suspicion of big brother, America. Vexille, a female agent who is part of the American strike force, SWORD, has been granted permission to infiltrate Japan and get a low down on the situation. That's it as far as the story goes, because the rest of the 109 minutes will be action-packed with infiltration, command-and-conquer, evade-and-destroy enemies and rescue style missions. Let's start with the technicals since that's the main reason I went to the big screen for. The good news - the technical department is virtually flawless. The buildings, structures and scenaries are breath-taking. Awesome is an understatement. The mechas were exceptionally well done. The design, colours and details, right down to the wirings and rigging feel almost solid you want to reach out and touch it. Armoured soldiers charging along the corridors and air buggies zipping at high speed in a tunnel really get the adrenaline rushing. Special mention must be given to the giant worms (reminds me of wrym enemies in Xenogears) living in the wasteland (ala Ergo Proxy) that constantly grow bigger by swallowing scrap metal. Animating them must be a feat because they move by revolving their bodies made up of pieces of scrap metals. Their tornado-like fluidity is astounding because they do not lose their details even when moving at high speed and crashing into barrriers. The not-so-good news...I definitely have a problem with the "human" portion of the animation. The supporting cast, to be exact. First up, Maria. She has the pivotal role in the plot as the rebel leader that is going to expose Daiwa. But her protrayal is a little too cold for my comfort. Bogged down by a past, carrying a burden and lacking charisma, she doesn't make a very convincing leader. And I think the creators must have realised this because in the end, the movie had to use Vexille to narrate to the viewers to affirm that Maria had indeed fulfill her role to change the world. The scene where her followers cheered after her weak little prep speech made my cringe. The movie need to bring across her convictions more. Next. Leon, the leader of the strike force as well as love interest for both Maria and Vexille. Sufficient time is given in the movie to progress the romance between him and Vexille and flash back is used quite effectively to fill in the viewers on Leon's past with Maria. He did serve his purpose of generating some tension between Maria and Vexille but as the stoic, strong and silent type, let's just say he also effectively became a vase. Thankfully, nothing is wrong with Vexille. She's your standard gung-ho agent bend on getting the bad guys. Her voice-over did an excellent job in her debut role as Vexille with the right about of energy and emotion, or at least what is required of the role. And this "human" portion is where I think 3D animation lost to 2D animation. Not only in terms of facial expression, but the movement is at times awkward and seemed forced. The robots are moving so much more gracefully! Sound-wise is largely forgettable loud, pounding rock music that sounds as good as the action lasts. Only the ending theme performed by mink made a lasting impression. Overall, it's still good. Just don't watch with too much expectations and it will be enjoyable. The storyline may feel a little weak but the creators did a good job by not dwelling on it too much and constantly ramping up the action factor so that viewers are kept excited. Recommended Audience: Explosions, collateral damage, blood and gore resulting from any typical soldier movie. A little on the violent side but nothing out of the ordinary. 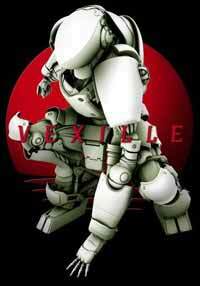 Vexille - 2077 Japan National Isolation © 2007 Oxybot, Avex Entertainment.